American Pancake: "Here Comes The Night Time" directed by Roman Coppola- "Win = Barry Manilow?" 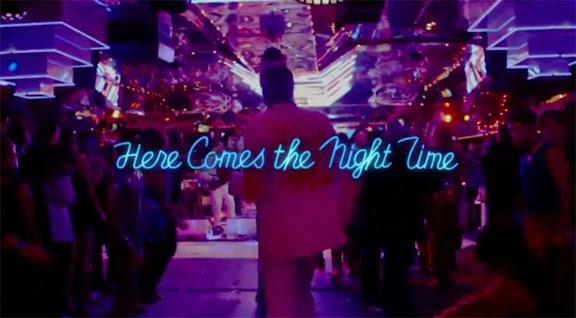 "Here Comes The Night Time" directed by Roman Coppola- "Win = Barry Manilow?" The Roman Coppola directed "Here Comes The Night Time" plays like a scenes in Wayne Coyne's head if he fell asleep while watching an old episode of "The Love Boat." As high octane as a dozen Redbull's and vodka drinks, there are furries, tons of celebrity cameos and Arcade Fire in matching white suits decorated wit sea and farm creatures and other random shapes in hot flashy colors.The look strikes me as a house band on a Carnival Cruise disco lounge. Take the suit that Win is wearing plop it on Barry Manilow in 1978 doing "Copacabana" and it works just as well. Is Arcade Fire trying to look campy or actually cool? I don't know. The Black swatch of make up across Win's eyes like a painted on Zorro mask pushes the look into weirdo land but not all that much. Arcade Fire has always borrowed their look from cultural clues and classic looks reminiscent of the 40's Europe's or Russian Propaganda-esque looks so this slick and shiny 80's artifice does seem strange. Maybe that's the point. As "indie" artists and "indie" audiences there is always the sense that both are outsiders looking in but with menagerie of celebrities who pop up in "Here Comes The Night Time" from Bono to Ben Stiller to Zack Galifianakis to Bill Hayder and more it is clear that Arcade Fire are the popular kids in school. While I didn't care for Reflektor and still don't I must admit that the songs on display on "Here Comes The Night Time" (including the title track) are pretty brilliant indeed. Normal Person does make you think of Talking Heads as does We Exist but the cool sultry feel of We Exist makes me think more of Roxy Music or ABC even. While I could not connect with Reflektor at all I already love these other songs. Thank god. I was worried that Reflektor was going to be their signature sound on the new album. "Here Comes The Night Time" breaks into quirky comedy works. I was entertained. Zack Galifianakis and Bill Hayder as super rude astronauts might be the funniest bit as Zack chides Arcade Fire "You DON'T need three Drummers!" Funny stuff as is the slow motion diversion into some drug induced nightmare or horror movie called "Festi." Arcade Fire also portrays a bad 80's band with Miami Vice pastel jackets- nice cameo by Rainn Wilson as the roadie. This short indie rock diversion never gets boring and has some cool and stupid surprises, stupid in a good way. I loved Michael Cera's Grandmaster Mike (what a rook worm!) Great job Arcade Fire, Great job Mr. Roman Coppala.